I was really looking forward to attending the ecosomatics course in Bristol in July 2014 and on arrival at the venue, Horse World, Bristol, was pleased to find a well maintained facility with happy and unstressed horses. We all assembled in the yard and were met by Sandi Howlett, our lecturer, who was brimming with enthusiasm and passion for ecosomatics (and craniosacral in general). The course was well designed with lab work and then hands on. Initially more lab work gradually changing over the four days to more hands on. The information, of which there was a substantial amount was given both verbally and in the manual and was second to none. Each morning, after any lab work was completed, a number of horses were brought in for us to treat; they were of varying size and shape. Initially Sandi would demonstrate the adjustment(s) we were learning and then in twos or threes we would work with a horse. One person was the handler, one the practitioner and initially one watching, but by the end of the course we were doing multiple hands on treatments. Some horses would need to walk around when being treated, some quite forcefully, if this happened you just walked around with them, still treating if you could. Most movement seemed to be at the beginning of any release. Over the four days we did have new horses to treat, but we also managed to do follow-up treatments on quite a number. This allowed us to see the physical changes that were happening after the treatments, which included changes in conformation; the shoulder angle, the shape of the withers (not so razor sharp), less tension around the head, also mentally and emotionally they became less stressed and worried. One thing that stuck in my mind when Sandi was teaching us was that the Psoas muscle as well as C5/6 and C7, where the phrenic nerve originates (controls the diaphragm) could effect how the horse breathes. This would become very important when treating my horse. For me this course brought all the elements of craniosacral together and I do not feel I would have gained as much out of the course had I not attended the human CST and somatoemotional release seminars first, I would therefore recommend to anyone thinking of doing ecosomatic to attend the human courses first. 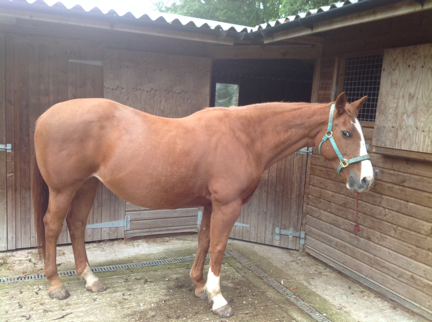 On returning from Bristol, I started work on my 12 year old, Irish, mare called Chrissie. I purchased her for my daughter in 2008. When purchased I knew she was stiff on her left rein, but thought this would be easy to improve. Little did I know that within two weeks she would change shape totally. She had been ridden every day and then put on a horse walker at the dealer’s yard, so when she came to us and this was not continued, all the underlying problems became apparent. She became more obviously croup high and when ridden it was like continuously riding down hill. She found it difficult to strike off in canter on right rein and the first time she was lunged she just ran as she could not elevate her shoulders to engage her hindquarters. Over the years she had improved with chiropractic treatment and kinesiology, however she still had muscle tension around her right atlanto-occipital joint, right shoulder and chest (supraspinatus, brachiocephalis, omotransverse, deep cranial and caudal pectoral, cervical and thoracic serratus) into abdominals and left hind leg (biceps femoris, semitendenous, semimembranous, rectus femoris, lateral, intermediate and medial vastas, gluteals) Her tuber sacrale on palpation was obviously cranial on the left and if you watched her walk from behind the right hind was ventral. Picture 1 Before initial treatment. 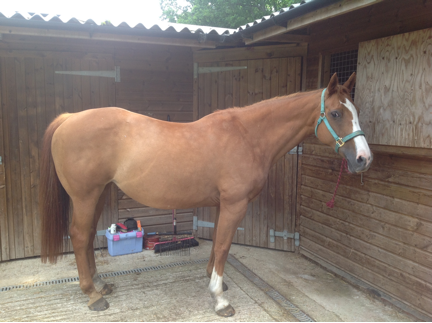 I treated Chrissie with the complete ecosomatics protocol and the result is below. Picture 2. After initial treatment. I have treated Chrissie at two/three weekly intervals since the course, she always likes the treatment. However, some of the reactions as her body releases have been dramatic to say the least. Sandi informed us on the course that the psoas muscle can effect the breathing as can C5,6 and 7, where the phrenic nerve originates and controls the diaphragm Chrissie had misalignments in both these areas and as she started to release off she looked as though she had COPD (chronic obstructive pulmonary disease), I was very close to calling the vet, but I had done this before only to be advised she was allergic to either pollen or bedding/hay. Changing or restricting these elements had made no difference to her symptoms and as she was releasing well with the ecosomatics, I persevered, but kept an eye on her. 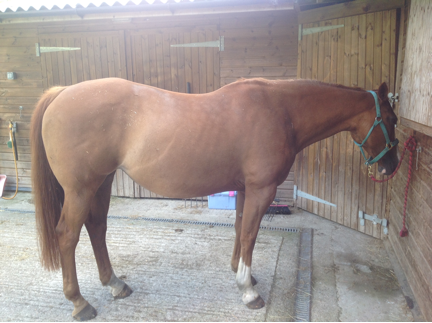 She then started to look bloated, her tummy was as tight as a drum, I thought she had gaseous colic, but she had no other signs, she was eating well, seemed happy in herself, she just looked like a bloated cow ready to explode. It seemed that if she was allowed to eat slightly too much it caused this problem, so I started feeding her little and often. On top of this, she had started coughing and of course the pressure in her abdominal cavity increasingly compromised her breathing. It is difficult to say whether it was the pressure around C5.6.7 which caused this or her psoas muscles, but I am pleased to say that as both areas began to release off these symptoms improved to a manageable level within a few days. Although in Picture 2 Chrissie looks much improved against Picture 1 she was still very tense, her left sacro-iliac joint was locked cranially and her left external and internal oblique abdominal muscles spasmed at the beginning of every ride. Although the picture does not show it very well she was croup high and broken at C3. she also could not walk up a 1/10 slop at the beginning of a ride as the pull on her pecstorals, abdominals and hamstrings meant she could not stride out. She would walk as though she was hobbled. Over the last three months the pull from Chrissie’s right atlanto-occipital joint into her right shoulder and left hind has been gradually releasing off. Her breathing is now normal and her ground work has improved. Her sacro-iliac joint has released skeletally, but muscularly there is still more work to be done. Her demeanor has changed; she is not trying to go faster all the time as she can now engage her hindquarters. There is still a lot of work to be done, but I have a much less stressed horse that is now a joy to ride. We have scheduled another class for this summer - July 3 - 6 2015 at the same venue. Followed by a CST for small animals class too. FInd out more Equine. Find out more Small Animals.